To teach that the Bible is the inspired and the only infallible authoritative Word of God, thus developing attitudes of love and respect toward it (II Timothy 3:15-17; II Peter 1:20, 21). To teach the basic doctrines of the Bible (Titus 2:1). To provide opportunities for the student to confess Christ as Savior and Lord (Romans 10:9,10). To teach biblical character qualities and provide opportunities for the student to demonstrate these qualities (I Samuel 16:7; Galatians 5:22,23). To teach the student how to develop the mind of Christ towards godliness (Philippians 2:5; I Timothy 4:7). To encourage the student to develop self-discipline and responsibility from God’s perspective (I Timothy 4:7; I Corinthians 9:24-27). To teach the student respect for and submission to authority from God’s perspective (Romans 13:1-7; Hebrews 13:17; Ephesians 6:1-3). To help the student develop a Christian world view by integrating life, and all studies, with the Bible (II Peter 1:3). To teach the student to hide God’s Word in his heart through memorization and meditation (Psalm 119:11; Psalm 1:103). To help the student develop his identity in Christ as a unique individual, created in the image of God and to attain his fullest potential (Psalm 139:13-16). To teach the student to treat everyone with love and respect as unique individuals created in God’s image (Philippians 2:1-4; Ephesians 5:21). To teach the student how to become a contributing member of his society by realizing his need to serve others (Galatians 5:13; Romans 2:10). To teach the student physical fitness, good health habits, and wise use of the body as the Temple of God (I Corinthians 6:19,20). To teach the student biblical attitudes toward material things and his responsibility for using them to God’s glory (I Timothy 6:17-19; Matthew 6:19,20; I Corinthians 10:31). To teach the student to understand and use the fundamental processes in communicating and dealing with others [such as reading, writing, speaking, listening, and mathematics (II Corinthians 5:20). 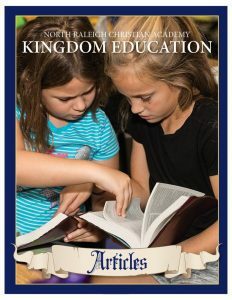 To teach and encourage the student to use good study skills and habits (II Timothy 2:3-7). To teach the student how to research and to reason logically from a Biblical perspective (Hebrews 5:14; Romans 12:2). To teach the student good citizenship through an understanding and appreciation of our Christian and American heritages [home, church, and nation] (I Cor.10:11; Rom. 13:1-7). To teach the student biblical creationism, a literal six days of creation, and God’s direct act of creating Adam and Eve (Genesis 1-2). To cooperate closely as servants to the parents in every phase of the student’s development, especially as it relates to the school program (Mark 10:45). To help parents to understand the school’s purpose and program. To assist parents in keeping up with the changing culture and its effect on the home and the implications for their children. To encourage parents to realize and shoulder their responsibility for the spiritual, moral and social education of their children (Deut. 6:4-7).